Guava trees are small fruit trees native to American tropic zones of Hawaii, Florida and Puerto Rico. Many guava varieties exist; some are sweet, while others are tart or acidic. Flesh color can be red, pink, yellow or white. Guava can be eaten raw or cooked, and is used to make juice and jam. 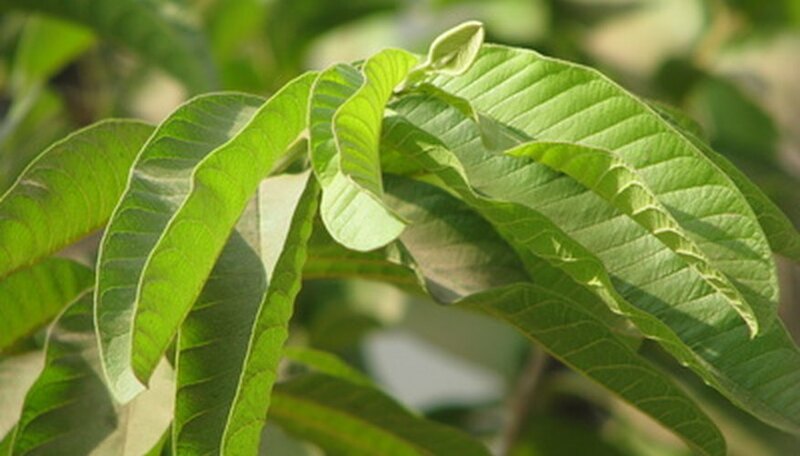 In some parts of the country, guava is considered a weed or invasive plant. Fruit production begins when trees are three or four years old. Choose a location for your tree that has full sun and is high enough to allow drainage. If the area does not drain well, you can build a mound to plant the tree in. The location should also be the warmest of your landscape, such as the south side of your home. Dig a hole three times the diameter and depth of the container the tree is in. Remove all grass another 6 feet around the planting hole. Clean the dug-out soil of all weeds, grass and debris. Mix one part compost with two parts of the original soil and place the amended soil in the planting hole, to fill it up to a level where the tree will sit at the same level or slightly higher than it was in the container. Remove the tree from the container, and place it in the planting hole. Fill halfway with soil and water to compact the soil around the roots. Continue to fill to ground level and tamp down firmly. Water the soil again to saturate the area. Water the guava tree every other day for the first two weeks and twice a week for the next two months. For the first year, continue to water twice a week if there is no rain for at least five days. Once the tree is established, watering will only be necessary during drought conditions. Apply a 6-6-6-2 fertilizer every other month for the first year. Fertilize four times a year from that point on. In the spring and through the summer, apply a nutritional spray containing zinc, copper, manganese and boron, every other month. Follow manufacturer’s directions regarding the correct amounts to apply. Spread a 4-inch layer of bark around the tree in the area where you removed the lawn grass. Keep the mulch at least 8 inches from the trunk of the tree. The mulch will keep weeds from growing and help to retain moisture. How Many Pounds of Topsoil in a Yard?